Remember the Lehman Examiner's Report? The 4000+ page report by the court-appointed examiner was lauded for a couple of weeks after it was released, and then largely forgotten. The media and blogosphere quickly moved on to the next outrage-du-jour (among others, the SEC's suit against Goldman), and never looked back. Well, I did not forget about it, and thanks to the uptick in flights — and thus reading time — in the last few months, I can now credibly claim to have read....well, not every single word in the Examiner's Report (some appendices are just pages of CUSIPs), but all of the substantive sections, including all of the substantive appendices, and many of the underlying documents. First of all, let me just say that Anton Valukas and the lawyers at Jenner & Block who wrote the Examiner's Report did a masterful job. I was, and continue to be, in awe of the quality and comprehensiveness of the report. The fact that they were able to do all the research, conduct all the interviews, and write the 4,000+ page report in a little over one year is amazing, and makes me incredibly jealous of their productivity. Now, since I read the whole damn thing, I think I have a pretty good handle on what went wrong at Lehman, and why it failed. Obviously, there isn't just one reason why Lehman failed, despite what most commentators would have you believe. But there's one issue that stands out to me as the biggest problem at Lehman — in short, they were misrepresenting their liquidity pool. In a huge way. It's disappointing that this issue has been almost completely overlooked, because the brazenness of their misrepresentation was shocking. I think the best way to think about it is this: on Friday, September 12, Lehman claimed that it had a $32.5bn liquidity pool, and on Monday, September 15, Lehman needed $16bn to finance non-central bank eligible collateral. So why, if their liquidity pool was twice the size of their funding requirement, did they have to file for bankruptcy? The answer is that Lehman didn't actually have a $32.5bn liquidity pool; they had, at most, a $2.5bn liquidity pool. That is not a typo. Earlier in 2008, Lehman's two main clearing banks, JPMorgan and Citi, started requiring Lehman to collateralize its intraday exposures. (Previously, the clearing banks would repay Lehman's tri-party repo lenders at the beginning of the day, and wouldn't require Lehman to pay back this advance until the end of the day.) Lehman reluctantly agreed, but requested that the banks release the collateral at the end of each day. Why did they care if the banks released the collateral every night if it just had to be posted again the next morning? 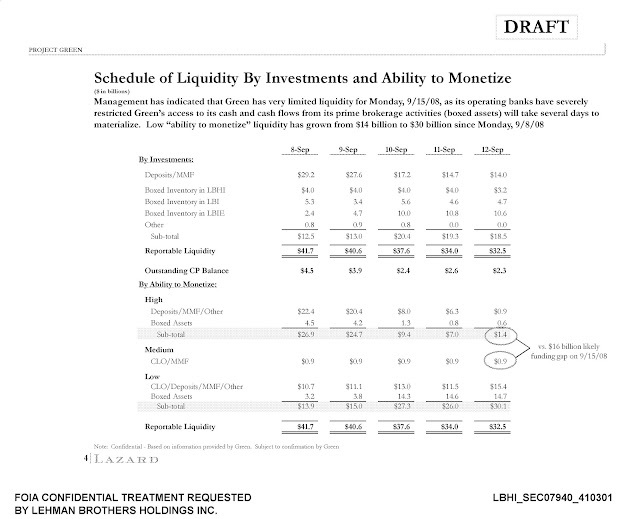 Because Lehman calculated its reportable liquidity at the end of each day, and if the clearing-bank collateral was released at the end of each day, Lehman considered it part of the "liquidity pool." By the end, roughly $19bn of the $32.5bn liquidity pool consisted of clearing-bank collateral. In no functional sense was the clearing-bank collateral "unencumbered" — if Lehman requested the collateral back, JPMorgan and Citi would have at the very least required them to pre-fund their trades (which Lehman didn't have the cash to do), and more likely would have just stopped clearing their trades. People at Lehman admitted as much to the Examiner. And once a broker-dealer's clearing bank stops clearing its trades, the broker-dealer is finished. Including the clearing-bank collateral in its liquidity pool was not only inappropriate, but also aggressively deceptive. But wait, there's more. 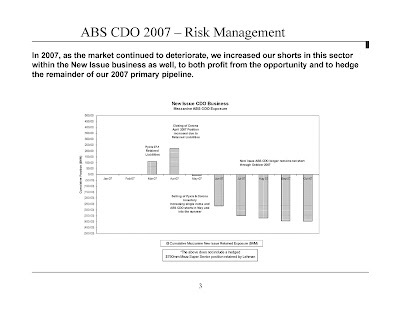 Lehman was also including in its liquidity pool non-central bank eligible CLOs and CDOs. 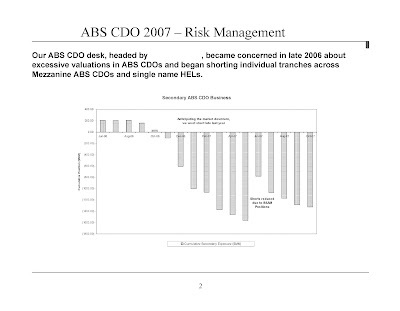 And they had the audacity to mark these CLOs and CDOs at 100 (par) for purposes of the liquidity pool, even though JPMorgan's third-party pricing vendor marked them at 50–60. Unfortunately, I can't do much in the way of legal analysis of the propriety of Lehman's decision to include clearing-bank collateral and junk CLOs/CDOs in its liquidity pool, because as the Examiner rightly points out, "No law, SEC regulation or GAAP-style rule governed the definition of a 'liquid' asset in the context of a CSE’s liquidity pool." The SEC considered an asset to be "liquid" if it could be monetized in less than 24 hours (though the SEC never enforced this definition, or wrote it into an actual rule). The "24 hours" standard is, in my opinion, the consensus in the industry — that is, I think if you asked most market participants, they would agree that at least most of the assets in a reportable "liquidity pool" should be able to be monetized in 24 hours. The U.S. dollar-denominated [Global Core] Excess [i.e., liquidity pool] is comprised of only unencumbered U.S. government securities, U.S. agency securities and highly liquid U.S. agency mortgage-backed securities, all of which are eligible as collateral in Federal Reserve open market operations, as well as certain overnight cash deposits. Our non-U.S. dollar-denominated excess is comprised of only unencumbered French, German, United Kingdom and Japanese government bonds and certain overnight cash deposits in highly liquid currencies. We strictly limit our Global Core Excess to this narrowly defined list of securities and cash because we believe they are highly liquid, even in a difficult funding environment. We do not believe that other potential sources of excess liquidity, such as lower-quality unencumbered securities or committed credit facilities, are as reliable in a liquidity crisis. 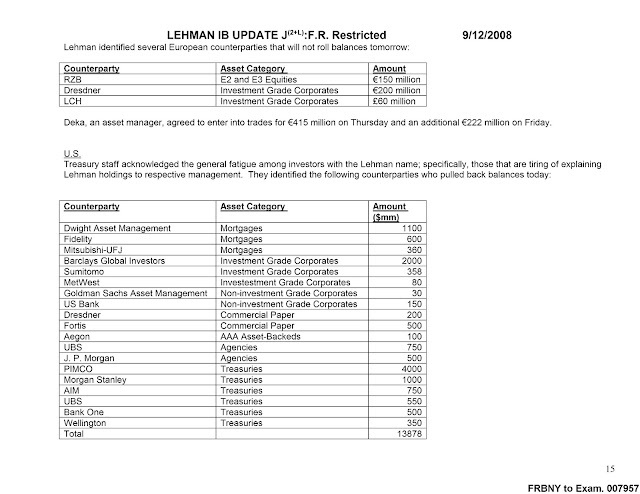 Using this definition (which is standard), Lehman had a liquidity pool of maybe $1.9bn on Friday, September 12. Now, Lehman wasn't always misrepresenting its liquidity pool. By the end of May, at least, it had a legitimate liquidity pool of over $40bn. But over the Summer of 2008, its liquidity pool steadily deteriorated, and Lehman simply refused to recognize this deterioration in its reported liquidity. JPMorgan and Citi demanded around $14bn more in collateral, and large asset managers — most importantly, Fidelity — pulled Lehman's repo lines and stopped rolling their paper. As of June 30, 2008, Fidelity had $14.1bn of repo lines in place with Lehman; by Thursday, September 11, Fidelity had pulled the entire $14.1bn balance. Notice that these are all large institutional asset managers — PIMCO, Morgan Stanley, Barclays, etc. — rather than those supposedly skittish retail investors. This was, essentially, the end for Lehman. There was no way they could replace $14bn of secured funding that quickly, especially after reporting such terrible earnings the next day. All of this highlights the importance of establishing liquidity requirements with a clear definition of a "liquid" asset — which, fortunately, is something Basel III does, and does rather conservatively. I'll save that for another post, though. As I noted on Twitter the other day, Dodd-Frank unfortunately did not address my #1 issue for financial reform: the fact that 12 C.F.R. Part 212 isn't called "Regulation L." I'm only half-joking, because this has been bothering me for years. You see, the banking regulations are divided into different subparts, and the subparts are known as "Regulation A," "Regulation B," "Regulation C," all the way through Reg Z (the last one is actually Reg GG). This isn't just an informal system, it's actually in the official Code of Federal Regulations — the official title of 12 C.F.R. Part 201, for example, is "Extensions of Credit by Federal Reserve Banks (Regulation A)." But for some reason, Part 212, which alphabetically should be Reg L, is just titled "Management Official Interlocks." So there's a Reg A–B and M–Z, but no Reg L. This, obviously, is madness. Obviously this was just a mistake (and some people call Part 212 "Reg L" anyway), but it's such a glaring mistake that it absolutely kills me that it's never been fixed (yeah, I'm OCD about this kind of stuff). It's been almost 30 years now. Clearly, the regulators are never going to fix this — despite occasional polite requests from a goodhearted lawyer. So to any Congressional staffers who may be reading: Please, for the love of all that is good and holy, fix this Heinous Blight in the technical corrections bill for Dodd-Frank. You will have the eternal gratitude of....well, probably just me. Let's Play "Name that Investment Bank"! Very savvy! 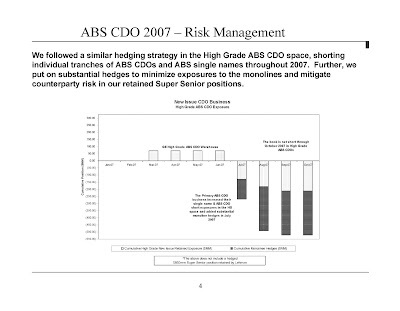 Clearly, this bank was no fool — they saw the problems in subprime coming, understood the implications for CDOs, and positioned themselves accordingly. Think you know who it is? I'll put the answer (and the full presentation) under the fold. [W]henever [Treasury] got involved with Congress, they pushed for less structural reforms. They pushed for the solution that embraced the status quo with arms wide open. Examples? Off the top of my head, ones with a paper trail: They fought the Collins amendment for quality of bank capital, fought leverage requirements like a 15-to-1 cap, fought prefunding the resolution mechanism, fought Section 716 spinning out swap desks, removed foreign exchange swaps and introduced end user exemption from derivative language between the Obama white paper and the House Bill, believed they could have gotten the SAFE Banking Amendment to break up the banks but didn’t try, pushed against the full Audit the Fed and encouraged the Scott Brown deal. You can agree or disagree with any number of those items, think they are brilliant or dumb, reasonable or a pipe dream. But what is worth noting is that they always end up leaving their fingerprints on the side of less structural reform and in favor of the status quo on Wall Street. These are some of the many ideas that progressives brought to the table, and there’s a documentable trail of each one of them being opposed and fought against by the administration. This is not to say that the administration is against reform. But it is to say that the problem I see is that they think we had was a crisis where regulators didn’t have enough powers, not that the financial sector in 2007 was too dangerous and too risky. This meme bothers me, primarily because there's so little evidence to support it. Saying that Treasury doesn't think "the financial sector in 2007 was too dangerous and too risky" is just false, and deeply unfair to Treasury. There's no evidence whatsoever for that assertion, and mountains of evidence to the contrary. Moreover, we did have a crisis where regulators didn't have enough powers. For one, regulators didn't have the authority to resolve a large nonbank financial institution (this is indisputable), and that was a massive problem which made the crisis significantly worse. Was this the only problem? Of course not. But Treasury never said that, and imputing that view to them is pretty disingenuous. It's a complete straw man, but useful for the progressive meme in which Treasury was opposed to Real Reforms (a.k.a., progressives' preferred reforms). A quick look at Konczal's list of examples shows just how strained this meme is. Of the 9 examples he provides, only 2 of them are actually "structural reforms" — Section 716 and the SAFE Banking Amendment (cap on bank size). The rest of Konczal's examples are just issues he happened to disagree with Treasury on. Whether FX swaps and forwards will continue to be exempt or not isn't even close to a structural reform. Nor is the end-user exemption, which only affects a very small percentage of swap transactions. And the argument over the end-user exemption was about the scope of the exemption — again, hardly a structural issue. Encouraging conferees to take the Scott Brown deal isn't even a substantive issue, so calling that an example of Treasury opposing structural reforms is comical. (Especially since the Volcker Rule wasn't progressives' idea; it was the administration's idea.) The "full Audit the Fed" proposal was still just an audit, so again — not even remotely structural. Treasury opposed the Collins amendment because they prefer to let regulators negotiate internationally-consistent capital requirements, not because they somehow oppose higher capital requirements for big banks. Higher capital requirements for Tier 1 FHCs has been one of the centerpieces of Treasury's plan from the very beginning (see the June 2009 white paper) so don't even try to claim that Treasury's opposition to the Collins amendment shows that they oppose higher capital requirements for big banks. Not gonna fly. On the trust-preferred securities issue, the Basel III consultation already eliminates TruPS from Tier 1 capital (and they're quantitatively limited in Basel II), so that wasn't the issue. Treasury's opposition was about process, not substance — which is why Treasury's Michael Barr said, "We 100% share the goal of the Collins amendment." Same goes for the leverage requirements — Treasury's opposition was about process, as the Basel Committee is in the process of introducing the first international leverage requirement. Finally, pre-funding vs. post-funding the resolution mechanism isn't a structural issue. The money for the resolution mechanism was always going to come from large financial institutions (>$50bn in assets), it was just a matter of whether they paid a portion of the cost upfront and the rest ex post, or paid the entire amount ex post. So in reality, there were only 2 actual "structural reforms" that Treasury opposed: Section 716 and a cap on bank size. That Section 716 was a bad idea is at this point common knowledge. Treasury was right to oppose it, and I doubt even Konczal would argue that point. Capping bank size, while not quite as ridiculous as 716, was still a silly idea. The main sponsors of the idea were progressives, but by no means did it command the support of all progressives — Paul Krugman, for one, loudly opposed the idea. So in the end, Treasury opposed the two progressive-backed structural reforms that they should have opposed, and fought for (and won) several very valuable structural reforms — e.g., CFPA, resolution authority, derivatives clearing. Somehow, though, this amounts to being "in favor of the status quo on Wall Street." Go figure. On a related note, I was obviously less impressed with progressives during the financial reform debate than Konczal was. Progressives were, for example, aggressive purveyors of misinformation on Section 716. It was also progressives who pushed lawmakers to oppose a fictitious derivatives loophole. And they got their wish — Sen. Cantwell voted against cloture because of the fictitious loophole, handing Scott Brown an enormous amount of bargaining power as the 60th and decisive vote. Cantwell now says that she'll vote for the conference report — after CFTC Chair Gary Gensler sent her a letter explaining the derivatives loophole (non)issue — but this comes after all the negotiating took place. Had Cantwell been on board during the conference committee, the Dems wouldn't have needed Scott Brown's vote, and could have ended up with a stronger Volcker Rule. And it's largely progressives' fault that this happened — it was their either reckless or dishonest advocacy that convinced Cantwell to oppose the bill, which allowed Scott Brown to extract significant concessions in conference and personally nix the $19bn bank fee. Awesome. Did progressives do some good work in the financial reform debate? No doubt. But they were far from the Forces of Light they seem to think they were. (II) maintains a substantial position in outstanding swaps in any major swap category as determined by the Commission. Clearly, whether an entity qualifies as a MSP (or "major security-based swap participant") will have to be determined on a case-by-case basis. Does this mean that all hedge funds will have to periodically provide the CFTC and SEC with their balance sheets? I assume it does — how else would the CFTC and SEC know whether a certain hedge fund should be designated a MSP? In fact, I think hedge funds will have to provide the CFTC and SEC with more than just their balance sheets. A simple balance sheet won't be enough to determine whether a hedge fund's outstanding swaps create "substantial counterparty exposure that could have serious adverse effects" on financial stability. So presumably, hedge funds will also have to provide the CFTC and SEC with information on their outstanding swaps positions, including the identity of their counterparties. These concerns were raised prior to the conference committee in a widely-circulated memo from one of the big law firms (I can't remember which firm), but for some reason, lawmakers chose to leave these issues unaddressed. The main reason the definition of MSP is so important for hedge funds is that nonbank MSPs will be subject to capital requirements (set by the CFTC or SEC). Significantly, the capital requirements won't be limited to the swaps activity that qualifies the entity as a MSP. In setting the capital requirements for MSPs, the CFTC and SEC are required to take into account "the risks associated with other types of swaps . . . engaged in and the other activities conducted by that person that are not otherwise subject to regulation." So once a hedge fund is designated a MSP for any type of swap, the CFTC and SEC will have broad authority to set capital requirements based on the hedge fund's entire operation. Personally, I don't have a problem with more regulation of hedge funds, or even minimum capital requirements for hedge funds. This is certainly not the ideal way to accomplish that, especially since it applies only to hedge funds that are major players in swaps (as opposed to HFs that are major players in bonds, futures, options, or even equities). But on net, in spite of the epically bad drafting, this could end up being a net positive for the financial system. Hedge funds, as well as the Blackrocks and PIMCOs of the world, will obviously scream bloody murder. That's to be expected. At the end of the day, Dodd-Frank's impact on MSPs will depend, of course, on what the CFTC and SEC do with their authority. (B) is not a designated contract market. This appears to be a pretty broad definition, which is a good thing. Crucially, pre-trade price transparency is not required — again, this is a good thing. I'm not surprised that pre-trade price transparency isn't required — Gensler wasn't naïve enough to buy the "pre-trade price transparency is always and everywhere a good thing!" argument, and pushed lawmakers not include such a requirement. Most crossing shops, including most so-called "dark pools," appear to qualify as SEFs. There's technically a question as to whether so-called "single-dealer systems" will qualify as SEFs. Banks' in-house counsel are already pushing an interpretation in which single-dealer systems would qualify as SEFs, but frankly, it's a pretty specious argument, and it's very unlikely to pass muster with the CFTC. (It has to do with what the phrase "that are open to multiple participants in the facility" applies to.) It'll be interesting to see if "negotiated dark pools" like Liquidnet qualify; I think they should, given the definition in the bill. There are two situations in which cleared swaps won't be required to trade on an exchange or SEF. First, when no exchange or SEF lists the swap (see § 723(h)(8)(B)). Second, essentially if the CFTC or SEC says that the swap doesn't have to trade on an SEF. Specifically, § 733(d) authorizes (but does not require) the CFTC and SEC to promulgate rules "defining the universe of swaps that can be executed on a swap execution facility." If a particular swap is not included in the universe of swaps that can be executed on an SEF, then it can be executed however the parties wish — even if an exchange lists the swap. It's safe to assume that the CFTC and SEC will both elect to promulgate rules defining the universe of swaps that can be traded on an SEF. When they do, this will be an important flashpoint to watch. In general, Dodd-Frank subjects all cleared swaps to "real-time public reporting" of "transaction and pricing data" (excluding the identity of the counterparties). However, § 727(E) requires the CFTC to promulgate rules: (a) specifying criteria for determining what constitutes a block trade, and (b) providing for a time delay for public reporting of block trades. These rules will be crucial. Trading in the swaps markets tends to be in size (although it's been a few years since I was in-house at a dealer, so this may have changed), so it's entirely possible, if not likely, that a significant percentage of swaps trades will be considered "block trades," and thus subject to the delayed reporting requirement. In that case, the length of the time delay for public reporting of block trades will be extremely important. Expect heavy lobbying from both the dealer banks and hedge funds on this issue. So what do I think of Dodd-Frank? I'm glad you asked. Before I get to some of the specifics, let me just say that in terms of broad policy, I am, unlike the vast majority of commentators, quite happy with the way the bill turned out. Barney Frank and Chris Dodd deserve a tremendous amount of credit for shepherding such a massive and impactful bill through Congress, and I think naming the bill "Dodd-Frank" is much deserved. The political and legislative realities involved in getting a major piece of legislation through Congress (and this is an uber-major piece of legislation) are so daunting nowadays that I had been expecting a far weaker bill from the beginning. That Dodd and Frank were able to get as much as they did is an extraordinary accomplishment. No, Dodd-Frank doesn't do anything as sweeping as 1930s reforms, but you know what? We already have deposit insurance, there's already a Securities and Exchange Commission, and the massively overrated Glass-Steagall would have done exactly nothing to prevent the Bear Stearns and Lehman failures. Also, the financial crisis, while bad, wasn't even in the same league as the 1930s banking crises. So spare me the disappointed historical analogies. Okay, now on to some specifics. By far the most overlooked aspect of Dodd-Frank is Section 627, which repeals the long-standing prohibition on paying interest on demand deposits. This was one of the centerpieces of the Banking Act of 1933 — one of the policies Sen. Carter Glass personally demanded (the other being the pseudo-separation of commercial and investment banking). This could have far-reaching consequences, and yet was barely even discussed. Swaps on gold, silver, copper, platinum, and palladium. Banks will have to spin-off (into their broker-dealer affiliates) their market-making desks in: equity swaps, any remaining commodity swaps, energy swaps, CDS on non-IG names, and uncleared CDS on IG names. In reality, the bank-permissible swaps in Section 716 represent well over 90% of the swaps market, so the provision will have very little substantive effect. But in that case, why have Section 716 at all? Why create yet another arbitrary bifurcation in the regulatory regime for derivatives — the same kind of arbitrary bifurcation which, by the way, gave rise to the OTC derivatives market in the first place (i.e., swaps vs. options/futures, and the infamous Swaps Exemption)? The answer, as everyone knows by now, is that Blanche Lincoln wanted to get re-elected, and in the end couldn't bring herself to admit that she had inserted an extremely ill-advised provision into the Ag Committee bill at the last minute. It's not something to be proud of. NO LOSSES TO TAXPAYERS.—Taxpayers shall bear no losses from the exercise of any authority under this title. First of all, what the hell does "taxpayers shall bear no losses" even mean? No outlays of government funds? Are "losses" being measured over a year? 5 years? 10 years? And who determines the value of the benefits taxpayers received (which is necessary to calculate net losses)? More importantly, this provision was clearly supposed to read, "the exercise of any authority under this paragraph," since the provision was a subparagraph of § 716(i), which addressed the treatment of a swaps entity's swaps and security-based swaps in FDIC receivership. But because of poor drafting, it applies to all of Title VII — is the CFTC going to be limited in its expenditures? Who knows. The frustrating thing is that § 716(i) is completely superfluous anyway (it just directs the FDIC to comply with applicable law), and was very obviously included for political reasons. This is the kind of thing that belongs in a press release, not actual legislation. So in the end, the revised Section 716 is acceptable, despite being (a) bad policy, and (b) very poorly drafted. I was highly critical of the Merkley-Levin amendment in the Senate, and unfortunately, the conference committee used Merkley-Levin as a template in their Volcker Rule negotiations. The final version of the Volcker Rule (sec. 619) is slightly better with regard to the prop trading ban, but it's still essentially a joke. The Street's lawyers will make short work of the prop trading language. The conference committee fixed the language that would have allowed banks to simply move their prop desks to London, which is a positive. They also eliminated the exemption for trades done "in facilitation of customer relationships," which was an almost comically broad loophole. However, there's still no limitation on the definition of "market-making," which is still merely one of several categories of exemptions. The conference committee also added more words to the "risk-mitigating hedging activities" exemption (§ 619(d)(1)(C)), but did nothing to actually narrow the exemption. Now the risk-mitigating hedging activity has to be "in connection with and related to individual or aggregated positions, contracts, or other holdings of the banking entity." This changes absolutely nothing about the bank's analysis under this exemption. Just as before, a bank simply has to identify a risk that it's facing — which will necessarily arise from "individual or aggregated positions, contracts, or other holdings of the banking entity" — and then justify the prop trade as a hedge against that risk. For the life of me, I can't think of a trade that would have been permitted under the previous "risk-mitigating hedging activities" exemption, but isn't permitted under the final language. And finally, the bill still includes the "catch-all" exemption for activities that "promote and protect the safety and soundness of the banking entity." The final version inexplicably retains the illogical "conflict of interest" provision, which attempts to prohibit trades that "would involve or result in a material conflict of interest . . . between the banking entity and its clients, customers, or counterparties." This is simply incompatible with market-making, which the bill clearly and explicitly allows. It betrays a serious lack of understanding of the very concept of market-making. As a result, the Fed will now be forced to define "material conflict of interest" so narrowly that it will virtually never be applicable. Apparently this was Sen. Levin's pet provision, which, really, is embarrassing for Sen. Levin. Finally, Dodd-Frank includes the so-called "hedge fund carve-out," which is really a "hedge fund and PE fund carve-out." It allows banks to invest 3% of their Tier 1 capital in hedge funds and PE funds. From a policy perspective, I think this is a bad idea. I had this argument with several people while the hedge fund carve-out was being debated. Proponents argue that it makes it much easier to raise money for a hedge fund if the bank that's promoting the hedge fund to investors is willing to invest some of its own money in the fund as well. I agree, that's true. Hedge funds are often "black box" investments — they're unwilling to reveal too much of their trading strategies to potential investors, out of fear that potential investors will simply steal their idea. To get investors comfortable investing in such "black box" hedge funds, the bank raising money for the fund will often invest some of its own money in the fund, as a show of good faith. In that sense, the "hedge fund carve-out" ensures that banks can continue to raise money effectively for hedge funds. I don't dispute any of that. But is it really necessary for the financial system that we keep the hedge fund start-up machine well-oiled? I think not. So maybe 30 hedge funds instead of 40 launch per month. I certainly wouldn't lose any sleep, and I doubt Ben Bernanke or Tim Geithner would either. One thing we do not suffer from is a dearth of hedge funds (and I have lots of friends in hedge funds). Would it harm the hedge fund community? Marginally, yes. But that's not the same as saying it would be bad public policy. But alas, the hedge fund community won the argument in the conference committee. To be honest, I consider capping the carve-out at 3% of Tier 1 capital to be something of a win — going into conference, the consensus on the Hill and on K Street was that the hedge fund carve-out would be capped at 10–15% of Tier 1 capital, and I'm legitimately surprised that it was scaled back so much.